Richard Eastes was the top earner this year bringing in $12.68 million to UCF. Under a sunset stroked sky in front of the University of Central Florida’s main administration building, university leaders celebrated the common traits of tenacity, collaborative spirit, and commitment to excellence that UCF’s top grant earning researchers share. 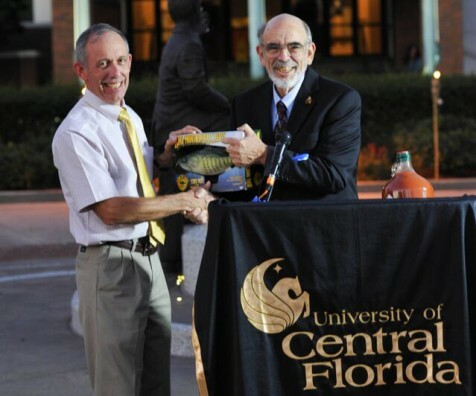 Twenty-nine researchers earned $1 million or more earning a bid into UCF’s Millionaires Club, which hosted the celebration earlier this month. Recipients received kudos and tongue and cheek awards such as a plush Underdog toy that went to a political science team that beat the odds by winning a $1.85 million grant. Another team earned the “United Nations” award for the project with the most non-U.S. collaborators. “Although we have already trademarked the phrase ‘America’s Leading Partnership University,’ our research and commercialization enterprise uniquely personifies that commitment,” said MJ Soileau, vice president for research & commercialization and the emcee for the evening. Soileau, who started the event in FY00 by presenting six millionaires with a special blend of his home-made hot sauce with a label emblazoned with his picture, unexpectedly had the tables turned this year when Provost Dale Whittaker presented him with a one-gallon personalized bottle of Tabasco. Millionaires received smaller bottles of hot sauce and a special blend of perfume or cologne called “Millionaire” and several gag gifts were also presented. The awards largely aligned with President John C. Hitt’s five goals for the university which include international prominence and focus in key areas of research, as well as emphasis on collaboration and partnership. The 38 researchers who received any size grant for the first time in FY15 were asked to stand as were the 35 patent recipients. Biggest Fish Award for the biggest single award of the year was presented to Richard Eastes of the Florida Space Institute for his project from NASA. In FY15 that project brought in $12,688,875. The complementary Every Little Bit Counts Award for the smallest grant received was presented to Subith Vasu from the College of Engineering and Computer Science, who received $800 from the Oak Ridge Associated Universities Travel Grants Program. The Money Bags Award, for the largest increase in funding, was presented to the Rosen College of Hospitality Management which went from one award for $19,362 in FY 14 to three awards for $291,028 in FY15 – a 1,403.1 percent increase. The Underdog Award was presented to Michael Macedonia of the Office of Research & Commercialization and Dr. Mark Schafer of the department of Political Science for $1.85 million from the Defense Intelligence Agency to establish an Intelligence Community Center for Academic Excellence. The John Hancock award for the project with the most signatures was presented to Xin Li, Erin Saitta, Jacquelyn Chini, Melissa Dagley and Brian Moore from the College of Sciences, and Michele Gill from the College of Education and Human Performance. The United Nations award for most non-U.S. collaborators goes to Pak “Ant” Kong of COHPA for his project titled “Toward a Multi-modal and Multi-level Analysis of Chinese (A-PHA-SHICK) Discourse with partners including the Chinese University of Hong Kong, The University of Hong Kong National, National University of Ireland and PolyU Technology and Consultancy. The awards for the most proposals submitted, 32, and most awards received, 35, were both presented to Tom O’Neal of the Office of Research & Commercialization. Grants are not necessarily received in the same year in which proposals are submitted.